The Lawyers’ Committee For Human Rights (YUCOM) was founded in 1997 as an expert, voluntary, non-governmental organization whose members are legal experts engaged in promoting and advocating for the rule of law and compliance with human rights, raising public awareness, conceiving, establishing and leading civic initiatives, providing legal assistance to victims of human rights violations, as well as developing co-operation with national and international organizations involved in human rights’ protection and promotion. YUCOM is renowned as an organization advocating for human rights and promoting the active participation of citizens through legal initiatives. It has profiled itself and gained much recognition as a human rights defender organization. After a regional campaign where YUCOM represented local partners in Serbia, torture was sanctioned as a criminal act and incorporated in the amended Criminal (Penal) Code of the Republic of Serbia in 2005. Changes of the law introducing hate crime (2012) and many more. Since 2005, YUCOM started filing cases to the European Court for Human Rights (ECHR) and is currently involved in judicial proceedings before the ECHR with cases that received a confirmation of priority from that Court. In March 2007, YUCOM won a case (V.A.M. vs. Serbia) before the European Court of Human Rights. This represents the first ECHR judgment against Serbia, obliging the Republic of Serbia to pay compensation to the victims. In 2005, YUCOM succeeded in a case before the UN Human Rights Committee. This decision was also the first of its kind in Serbia. YUCOM is actively writing shadow reports related to the international obligations of Serbia to the United Nations, Organization for Security and Co-operation in Europe (OSCE), the Council of Europe and others. Most recently, in 2017, YUCOM sent the shadow report to the UN Human Rights Committee on the implementation of the International Covenant on Political and Civil Rights, as well as for the Universal Periodical Review (next upcoming in 2017). Today, YUCOM, as a member of numerous ad-hoc coalitions, has both the capacity and an extended experience in successfully leading campaigns for the reform of legislature and legal practices. YUCOM continues, by means of active and constant public appearances along with public support that it gains through its work, to successfully impose a reference frame for the system of values and standards that contributes to confront the past and implement a transitional justice and the rule of law. In addition, YUCOM is highly engaged in representing other NGOs in cases against NGOs, with the aim to assist the development of more elaborate and efficient mechanisms for the protection of human rights defenders in Serbia. During its 20 years of existence, YUCOM’s Legal Team has been constantly and successfully providing legal assistance to victims of human rights violations before relevant national bodies and courts, including the Serbian Constitutional Court, the European Court of Human Rights and the UN Human Rights Committee. On an annual basis, YUCOM provides free legal aid to more than 1000 citizens as well as numerous legal advices and runs a database of users and cases’ status. YUCOM has also developed a quality control technique and will offer it to other free legal aid providers. YUCOM currently represents human rights defenders and organisations that are subjects to attacks, such as activists of Woman in Black, Youth Initiative for Human Rights and many others. Results of the YUCOM strategic litigation were, inter alia, changes in the constitutional provisions to provide more efficient protection before national authorities. YUCOM has also shown a strong commitment in setting limits for freedom of expression in order to overcome racism and intolerance in Serbian society. In that respect it had successfully advocated for hate speech incrimination, conducted a research focusing on the implementation of laws on the media l related to their responsibility to promote tolerance and ban discrimination and hate speech and it also led numerous hate speech’s cases in front of the courts. 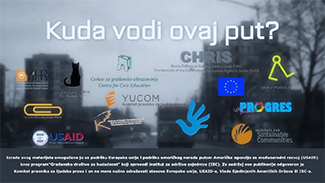 YUCOM cooperates with various civil society organizations providing and protecting human rights in Serbia. Moreover, YUCOM has a relevant experience in sub-granting and developed sub-granting components in 2012. It allocated more than 30 small scale projects to CSOs, monitored their implementation and mentored some of the implementers. These activities were supported by the EU, UK FCO and others. YUCOM is coordinating the Coalition for Equality www.korak-hapi-step.eu, which advocates for human rights on a regional level (Serbia, Montenegro, Kosovo, Macedonia and Bosnia and Herzegovina) and focuses on the different areas of discrimination, including LGBT rights, strengthening the role of women in politics and public life and monitoring court procedures against discrimination. During 2012 and 2013, YUCOM implemented the project “Supporting Adequate Response of the Serbian Judiciary through Corruption Trial Monitoring”, with the support of Partnership for Transparency Fund and since then, YUCOM has a team for trial monitoring within the anticorruption efforts of Serbia, currently supported by OSCE and Partnership for Transparency. Within this project a comprehensive website was launched (www.antikorupcija.yucom.org.rs) consolidating all the basic information on the identified case trials: cases designation, the ruling judges in judging chamber, the crime committed, suspects and accused, including media reports, articles and features about the cases in order to increase transparency and liability of the judiciary work in Serbia. YUCOM carried on with these activities in 2014 with the project “Regional Anti-Corruption Action: Supporting the Judiciary in Combating Corruption in the Western Balkans”, this time by creating a regional network on trial monitoring of cases featuring corruptive elements. Furthermore, YUCOM represented the prominent women group, which was also denied the right of peaceful assembly. On the basis of YUCOM’s motion before the Constitutional Court, the decision that was banning the peaceful assembly was found unconstitutional in 2012. YUCOM also represented Falun Gong movement in 2014, ending with recommendations issued by the Ombudsman and was involved in many other strategic cases of human rights violations.In 2017, after a multiyear successful implementation of the activities of the Triple A for citizens, YUCOM initiated the registration of a wide regional network on access to information, free legal aid. The main achievements related to human rights advocacy are the adoption and implementation of a number of important laws, including the Amnesty Law in 2000, Free Access to Information, Law on Educational system (2009), Law on Ombudsman, provisions on family violence (2014), the introduction of hate crime into Serbian legislation in December 2012 and many others. YUCOM is a member of the working group for drafting the Free Legal Aid Law which is in its final stage and it has also assisted in the drafting of numerous laws, such as, currently, the Law on Missing Babies that must be adopted by Serbia followingthe European Court on Human Rights’ decision against Serbia. In respect of Chapter 23 of the EU negotiation process covering judiciary and fundamental rights, YUCOM is a founder of the National Convention on the European Union – NCEU, with European Movement of Serbia. YUCOM is leading the Working Group of NGOs for Chapter 23 as part of the Human Rights House portfolio. Within the Working Group that YUCOM coordinates, more than 50 organisations are actively engaged in specific topics, depending on their expertise It also comprises civil society organisations, judges’ associations, prosecutors’ associations, judicial associates, bar chamber and similar.In 2016, YUCOM organised more than 15 different meetings with the Working Group for Chapter 23 in Serbian Parliament and around Serbia, covering several topics such as the Constitution, the Independence of the Prosecution, the National minorities and many others.The National Convention of the European Union (NCEU) is the official recognized framework for the timely participation of CSOs in Serbia’s EU accession negotiations. In the first year of its enforcement it was strongly supported by the National Assembly of the Republic of Serbia (by including the NCEU in the Committee for European Integration Decision regulating the formal process of revision of negotiating position). YUCOM was also actively involved in the activities of OSCE Serbia 2015 chairmanship, within the international Civic Solidarity Platform and used the chairmanship to prioritize some of the areas related to fundamental rights. Since then, YUCOM has cooperated with other chairmanships, advocating for the topics of human rights to lean with the priorities of the Human Dimension of Serbia. YUCOM strongly cooperates with the Serbian Parliament, relevant committees such as the Committee for Judiciary, Committee for Human, Minority Rights and Gender Equality, Committee for European Integrations and similar. Relevant Ministries, starting with the Ministry of Justice and Ministry of State Administration, are in direct contact with YUCOM for the achievement of numerous activities, especially related to judicial reforms (implementation of the judicial reform strategy), reform of state administration and human rights, in light with EU integration and negotiations within the Chapter 23 opened in 2016. Office for Human and Minority Rights of the Government of Serbia, Office for Cooperation with Civil Society, Serbian Integration Office and many more are also seen as partners in the implementation of the activities and memorandums of cooperation are signed and executed. The judiciary, in the first place through High Judicial Council and State Prosecutorial Council, sees YUCOM as an ally in the fight for the independence of the judiciary, especially in the upcoming reform of the Serbian Constitution (set for the end of 2017 and probably postponed to 2018). YUCOM is asking for a greater transparency of these bodies and collects documentation on their work, promotes good practices, as for the organisation providing free legal aid in Serbia, collects data and strengthens them to work in their full capacity, including their role in the judicial budget. YUCOM also conducts trainings for judges and prosecutors with Judicial Academyon human rights, European Court on Human Rights practice and more. YUCOM profits of a wide and longstanding cooperation with independent institutions– Ombudsman, Commissioner for Equality, Commissioner for Free Access to Information, Agency against Corruption and State Audit Institution, as well as with Bar Chamber of Serbia. YUCOM has helped many of these institutions since the drafting of their constituent acts and further on, since their entry into force. Relevant partner organizations on YUCOM’s projects in the last three years were: Belgrade Center for Human Rights, Human Rights House Croatia, Bosnia and Norway, CHRIS Network, Gay Straight Alliance, Youth Initiative for Human Rights Serbia (Bosnia, Croatia and Kosovo offices), Humanitarian Law Centre Serbia and Kosovo, ADI Bosnia, Labris, Partnership for Social Development, Expert Forum Romania, Vesta BiH, BH journalists, Prosecutors’ Association of Serbia, LGBT Forum Progress (Montenegro), Centre for Civic Education, ECAS, NUNS, NDNV etc. Some of the supporters/donors in the previous years were: OSCE, Matra Embassy Fund – Ministry of Foreign Affairs of the Netherland, British Embassy, Institute for Sustainable Communities, European Union Delegation to the Republic of Serbia, European Commission, Front Line Defenders, Swedish International Development Cooperation Agency (SIDA), International Management Group (IMG) and Gender Equality Directorate of the Ministry of Labour, World Bank, Civil Rights Defenders, Ministry of Foreign Affairs of Germany, Office for Human and Minority Rights, World Bank, Partnership for Transparency Fund, American Bar Association, Open Society Foundation (international and in Serbia), Bulgarian MFA, MFA of the Czech Republic, JRGA – USAID etc. You may find the complete list of donors and projects on our website in the section Projects.Currently YUCOM does not have a main subvention for its core activities. Along with progressive research activities and writing articles, YUCOM also has a significant publishing experience in the areas of judicial reform, free legal aid, discrimination, human rights and more, available at http://en.yucom.org.rs/category/human-rights-series/. Also, YUCOM’s large media coverage on topics related to judicial reform, rule of law, human rights and fight against corruption has developed a serious expertise and implemented a communication strategy. Annually, YUCOM staff has more than 1000 statements in different national, regional and international media transmitted to different portals as well as on YUCOM’s social media (FB, Tw, Instagram and YouTube channel) and subpages it has developed (on Constitution – @mojUstav, anticorruption, discrimination, @korak-hapi-step and many more). In 2011, YUCOM formed the Human Rights House Belgrade. HRH Belgrade along with four prominent CSOs became a member of the Human Rights House Network, based in Oslo, Norway. In 2014, YUCOM moved to the HRH in Belgrade that was renovated and it became its base for its widespread activities. Within the premises of the HRH Belgrade YUCOM can offer capacity/space for trainings and conferences (one large hall with a maximal capacity of 100 participants and 2 smaller with a maximal capacity of 30 participants, as well as a human rights library) and it can be seen as a valuable asset to enhance cooperation with the organisation. This space is also freely offered to other CSOs working in the field of human rights. As an active and effective organization in Serbia and across the region, we will keep our focus on further strengthening the sustainability of the organisation and promoting free legal aid to citizens, as well as on advocacy campaigns and on Serbian EU accession process as a core activity for modernisation and democratisation of the country in line with human rights standards and the rule of law.